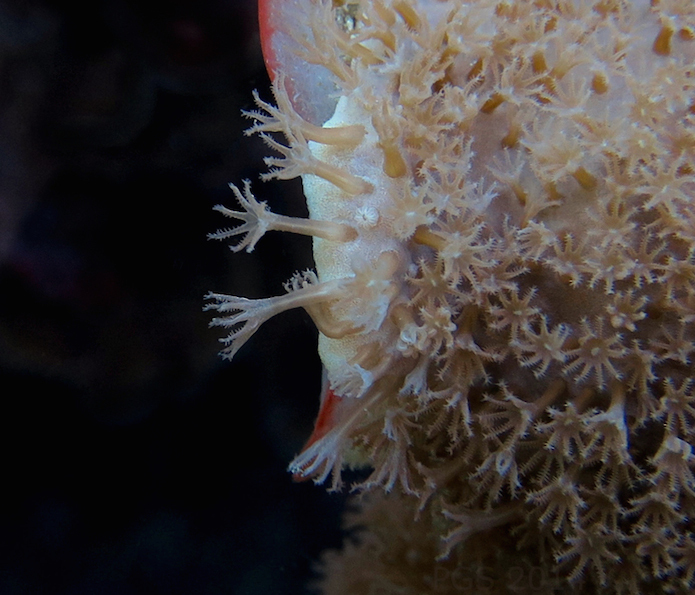 The photograph is of an Octocoral, a soft coral magnified, taken last week in Sydney. This winter in the water I’ve found myself fixated on the relations between scales, on micro-structure and macro-structure, and the smallest animals I can see. 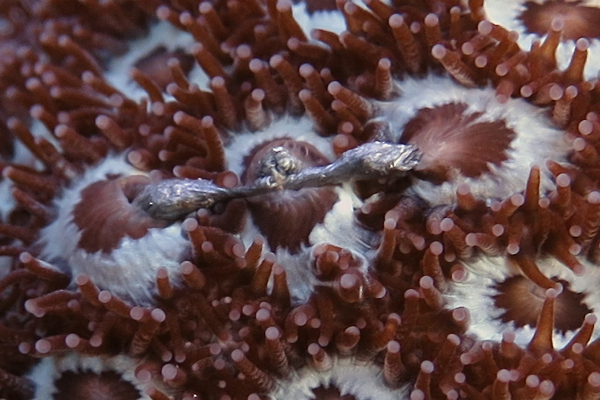 The stripe seems to be the remains of a fish, a tiny fish, being slowly consumed by the colony of Zoanthids. If you look closely you can see what look like a pair of jaws remaining on the far right. 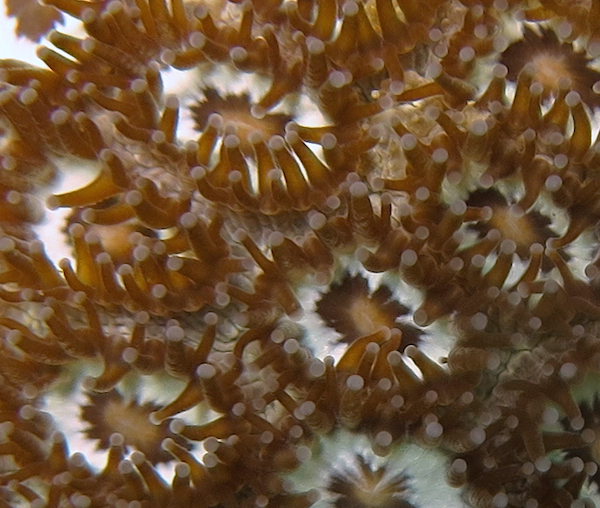 There are indeed invisible fish around us, and organisms within organisms, as in the zoanthid, even if Leibniz’s version of this view was fanciful and the fates of the fishes are not to be envied. Why did Leibniz believe a view like this? Philosophers have usually seen Leibniz as someone who reached all his conclusions, including these very strange ones, by pure reasoning about how things have to be. Leibniz did, however, also live around the time of the first published microscopic observations of the world, by Robert Hooke in England and Antonie van Leeuwenhoek in Holland (whose images were published from his letters to the Royal Society). For someone struggling, as I am, for the first time with magnifying lenses under water, it was interesting to learn that a new interpretation of Leibniz’s thought has been developed, by Justin Smith, which emphasizes the influence of these early microscopic observations, especially those of Leeuwenhoek, who Leibniz knew and visited. Smith thinks that Leibniz’s “worlds-within-worlds doctrine… was inspired by microscopy from the very beginning.” My former colleague Jeff McDonough has written a review of Smith’s book which is more cautious on this point; McDonough thinks that even if microscopes played some role, Leibniz was committed to general positions that had the peculiar idea of endless plants and fishes as a natural conclusion. How is that possible? Well, Leibniz thought that he could show that matter must be divided infinitely into parts, and also that the basic entities in the world must be organic and unified, not mere chunks of dead stuff. So all matter comprises tiny organism-like parts. Perhaps the microscope then added, for Leibniz, the details of their form, a form of ponds and plants and fishes. Thanks to Derek Skillings for help with zoanthid biology. 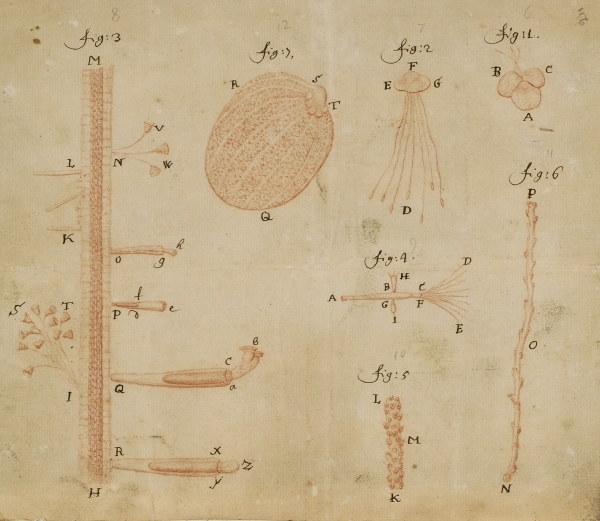 The final image is from a letter from Leeuwenhoek to the Royal Society of London, 25 December 1702. 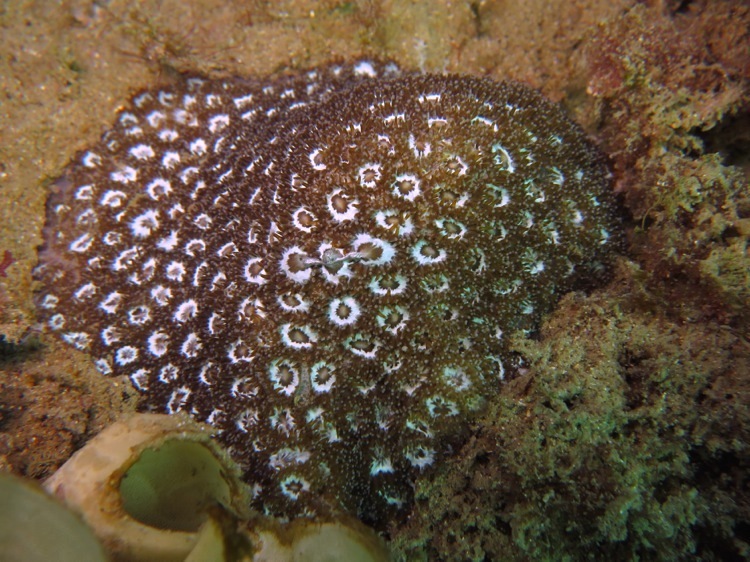 This entry was posted in Bodies and Minds, Cnidarians, Vertebrates and tagged Leibniz, zoanthid. Bookmark the permalink. Great post! The pictures are really fantastic. I had two quick thoughts. First, I think Leibniz was also encouraged in the belief that there should be microscopic organisms by his instinctive thought that scale shouldn’t matter in general. We notice all sorts of organisms that are roughly our size, but it would be an ugly anthropomorphism to suppose that there aren’t countless organisms smaller than us too. And the same thought should apply at microscopic levels too. So at every scale, we get the thought that there ought to be even smaller organisms. Leibniz, of course, turned out to be wrong about scale invariance across the board, but it still strikes me as an exceptionally curious fact about the world that in a deep, profound sense scale does seem to matter (even for foundational physics). Second, Leibniz’s conjecture that there should be countless organisms even in a drop of seemingly pure water has always struck as a nice case where Leibniz’s crazy philosophy led him to a position that is closer to the truth than commonsense could possibly lead. There may not be bugs within bugs to infinity, but there are certainly a lot more critters around us than most people in Leibniz’s day – and in our day! – generally suppose. Looking forward to more posts! Re: “it still strikes me as an exceptionally curious fact about the world that in a deep, profound sense scale does seem to matter.” Yes, I agree, and in these areas – those that deal with the material basis of life, behavior, and the mind – scale seems to matter more and more. I recently read Peter Hoffman’s book Life’s Ratchet, which is a popular science book, but one with quite a bit of philosophical relevance. Hoffman argues, in effect, that living activity can only naturally arise, and perhaps only exist, at a particular spatial scale, the nanoscale (the scale of millionths of a millimeter). This is the spatial scale admitting activity that is both spontaneous and orderly in the ways required for life. When things get bigger, or smaller, you lose this combination, for one reason or another. If this is right, there is a natural limit, on the bottom end, to the spatial scale on which a fish can exist. And any fish much larger will be made up of sub-fishes – or, rather, of cells. Thanks, I’ll definitely put the Hoffman on my reading list. What you said got me thinking about different ways in which scale might “matter.” Three struck me right away: (i) even geometrical laws will dictate that some things scale up a different rates, e.g. surfaces will scale up more rapidly than the volumes they enclose and that could have important implications. I think Galileo was maybe the first person to think this through carefully in a physical context. (ii) It might be the case that some effects or forces are so slight, or cancel in such a way, that they are generally only significant at some scale even though they apply uniformly across all scales. I take it that some molecular forces are like this. (iii) There might be laws that only apply below (or above) some scale. One could imagine a theory that said, for example, that certain indeterminacies – just as a matter of fact – apply at a micro-scale but do not apply at the macro-scale (or vice versa). For what it is worth, I suspect that Leibniz must have known and had no problem with (i). He was familiar with Galileo’s work and makes some remarks about a sphere optimizing surface area to volume. There’s also reason to suppose that understood (ii) and was okay with it. His earliest physics cleverly exploits a similar idea. I think he would have balked at (iii) however. Among other things, he might have seen it as a violation of the PSR [principle of sufficient reason]. I’ll be curious what sorts of reasons Hoffman has in mind for why the just-right-combination for life occurs only at the nanoscale. Regarding your three scale-dependent factors and life, I think the emphasis in Hoffman is (i) and (ii), though I am not sure about the boundary in some cases between scale affecting the importance of a factor and scale affecting its very presence. Biologists often make much of this factor in relation to cell size. If cells were much larger, their volumes would be too big in relation to surface area for some important ‘traffic’ to occur. This I think is a big deal, and part of what people like Hoffman want to tell a story about. For Hoffman, the nanoscale in water is a context in which machines can work spontaneously, this being due to the continual series of tiny collisions of randomly moving water molecules that can initiate events, and the spontaneous changes in conformation that larger molecules undergo. He does not develop the philosophical side of this very far, but one could argue that our intuitions about “mechanism” and materialism are too influenced by our assumption of a dry-land and macro-scale context. Leibniz argued against materialism by imagining walking around inside a much-expanded thinking machine, as one might walk inside a mill. “Assuming that, when inspecting its interior, we will find only parts that push one another, and we will never find anything to explain a perception.” I think Hoffman would say that Leibniz’s imagined mill was necessarily a macro-scale dry-land object. An aqueous micro-mill (or nano-mill) would be a very different place, especially with respect to the explanation of how minds work. I suspect Leibniz might reply that it’s not different in a way that really matters. Interesting bit at Nat Geo. This has me wondering if humans have food processing genes that turn on and off and if when we eat might have an impact on how we process and store nutrients and calories. Are we simple ‘calories in vs calories spent’ metabolic engines or would we gain or lose weight depending on when we ate even if we had the same caloric intake/use during the day? Regarding the whole ‘smaller and smaller’ concept…don’t you know? It’s turtles all the way down! And a further connection comes from the fact that human digestion is much influenced by the bacteria living in our guts, bacteria which might have their own temporal rhythms of activity and gene regulation. Nice National Geo article, too.